This one is pretty cool, it’s a light caramel with a touch of pink and it has a light aqua shimmer to it. I think it came across in the photos. The shimmer shows in the sun but comes and goes as you tilt your fingers, really different. I have nothing like it in my collection. 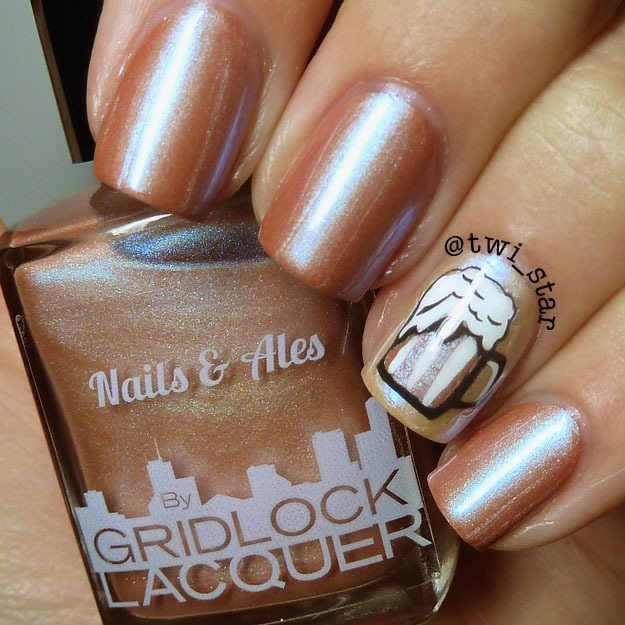 Nails & Ales is a great neutral, it would be perfect for the office. This is 3 coats, nice application. You can see the aqua shimmer best in this photo. It’s not super obvious, it doesn’t scream hey I’m aqua shimmer! But it’s there, I think it is really pretty. 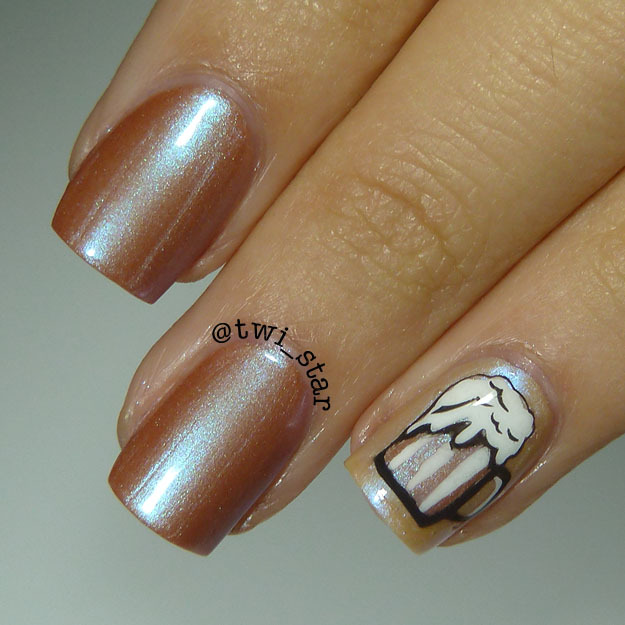 I can see myself pairing Nails & Ales with a brown cream, I think they would play well together. Thanks for checking out my review! 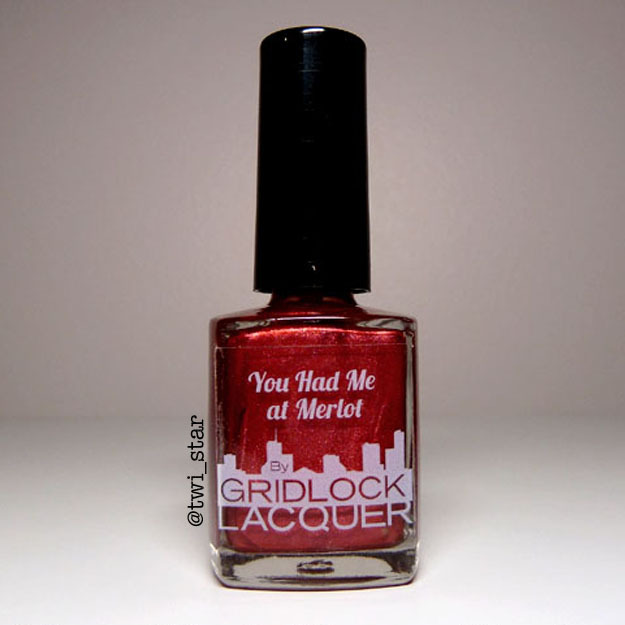 Today I have the first of a new collection of polishes from Gridlock Lacquer. Get this, the collection is called Beer & Wine! How great is that? 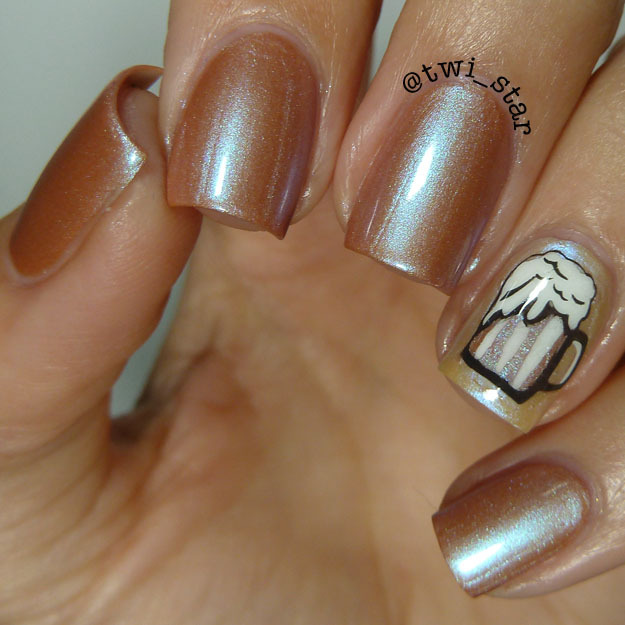 All of the polishes are inspired by and named with a beer and wine theme. 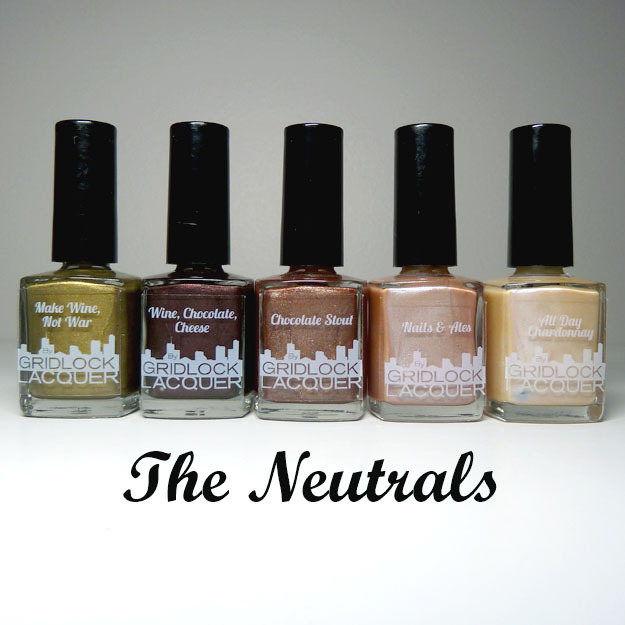 Sooooo many great colors in this collection, neutrals and brights. 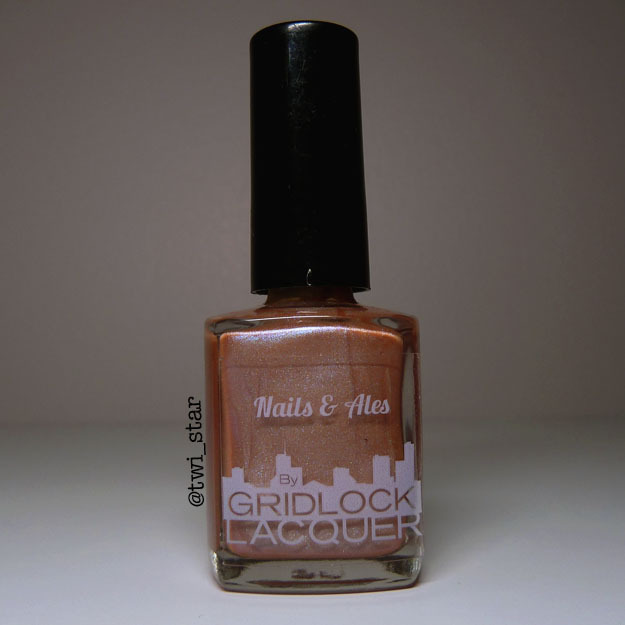 They will be available on store.gridlocklacquer.com in about 2 weeks. I will update this post once they are available for purchase. Onto the first swatch, You Had Me at Merlot. Isn’t it pretty! I wouldn’t call it a true Merlot wine color, it’s more of a merlot mixed with water haha! 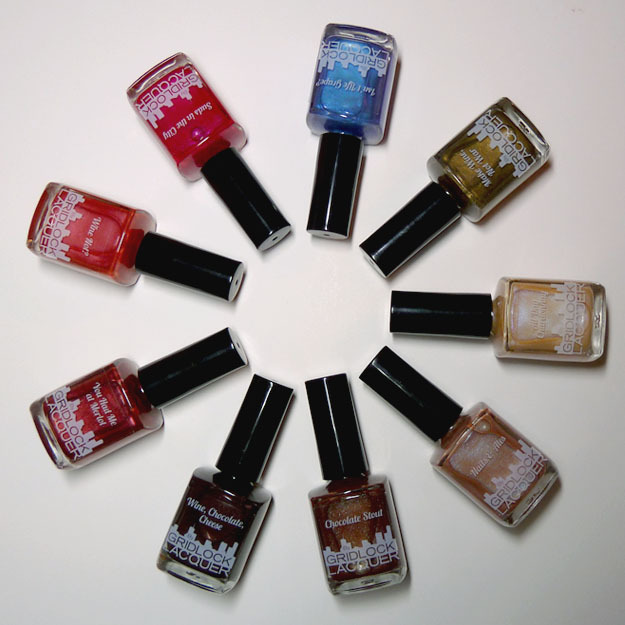 It has a very glowy quality to it and is a fab color for Fall. 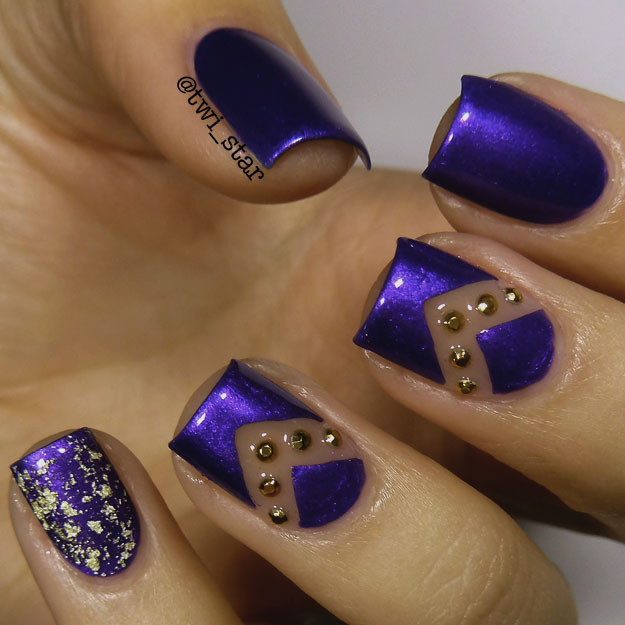 This gorgeous jewel tone is shown with 2 smooth coats, great application on this one. 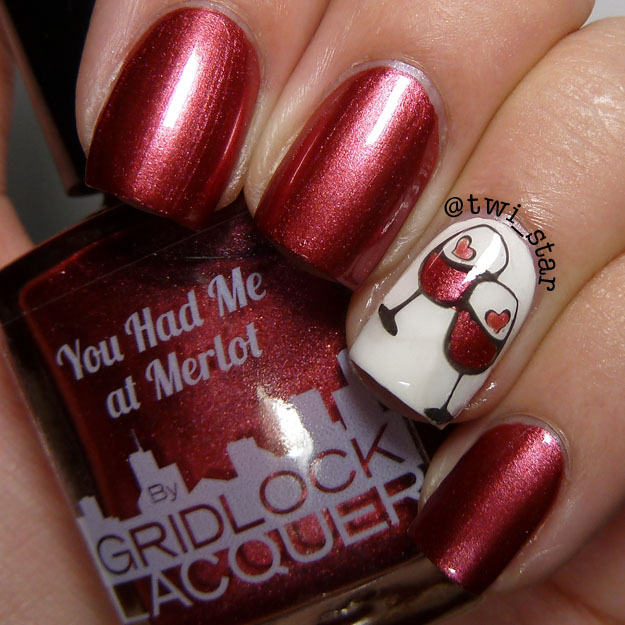 For my accent nail I used a Julep Kate as my base color, and a Bundle Monster Holiday stamp plate for the wine glasses. I left the stamp on the stamper and then painted in the wine and removed from the stamper once dry and applied to the nail. Here is a close-up of this gorgeous polish. I wore this mani to a Fall wildlife festival, it was a beautiful sunny day and my fingers were just all glowy and sparkly, perfect! Thanks for looking! 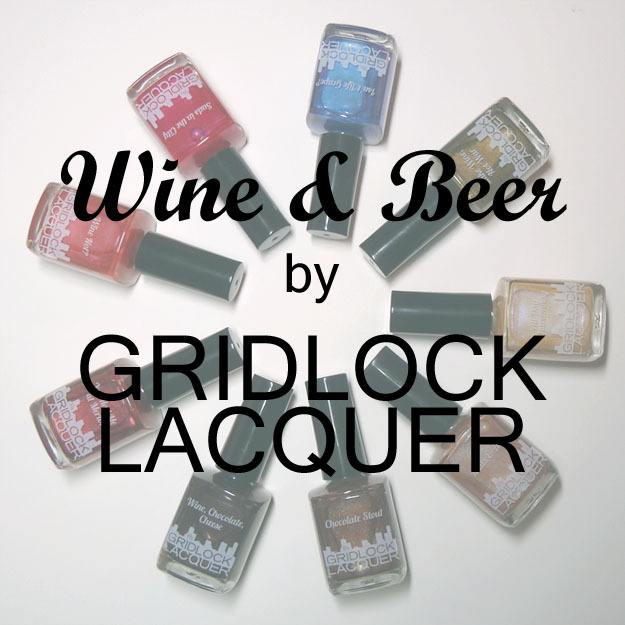 Here is a preview of a new collection from Gridlock Lacquer, The Beer & Wine Collection! I will have all swatches up over 2 weeks. I apologize for not accurately showing Julep Avni, it’s so intense my camera wanted to make it kinda blue and I couldn’t even color correct it in photoshop uggghhh! In person, it’s darker and very vivid. If you love purple you’d love this color, sadly it is sold out and not sure if Julep will be getting more of this color in. Sorry to be a Debbie Downer. Here is Avni, she is stunning. The color here is pretty close but it’s darker in person. Formula was very nice, this is 2 coats. For the pinky I used OPI Pure gold topcoat. This is one coat. 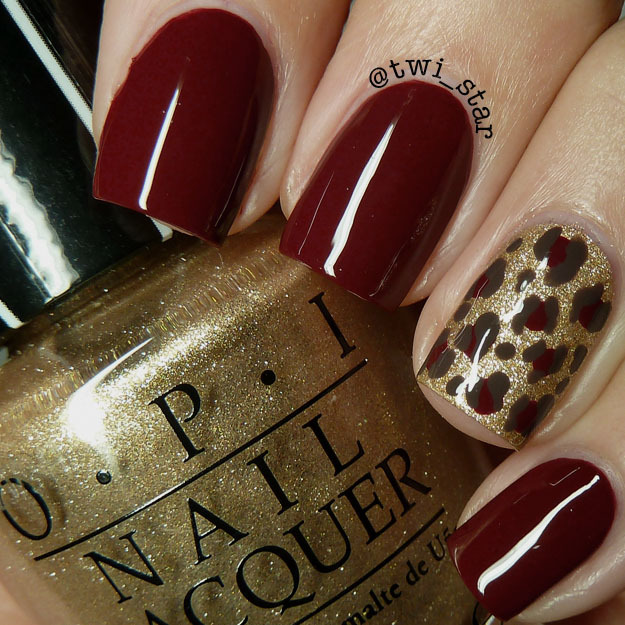 I love this top coat! It’s only bad point is the base is kind of tinted yellow, I assume it’s not supposed to be like that but it got tinted from the real gold flakes so sometimes it will alter the look of your base color. 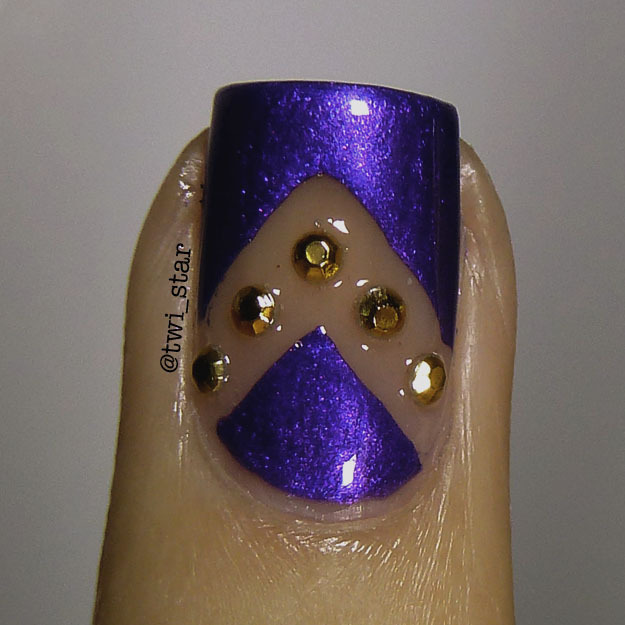 For the middle and ring I copied Sloteazzy’s negative space and gold jewel look. 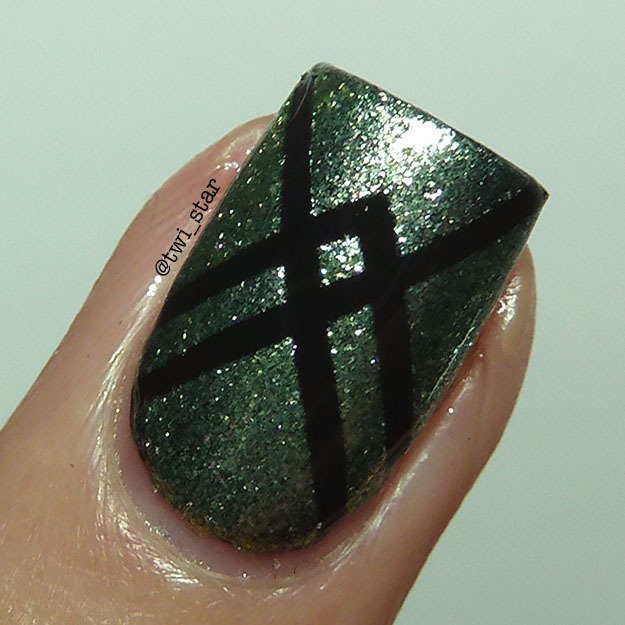 I think mine came out ok, I didn’t have thin nail vinyls mine were a bit thicker otherwise I would have liked it more. Note to self, buy some thin straight nail vinyls. I got the little gold jewels from ebay. 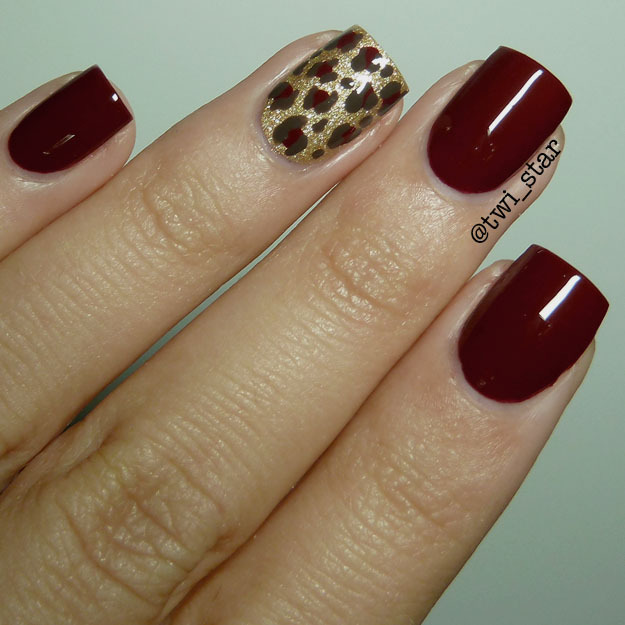 Overall I like this mani! I went through the Dunkin drive through this morning and I grab my cup and the girl gave my nails a confused look…………either she liked them or she thought they were disgusting! haha! I just drove away with my medium dark roast black with sugar mmmmmmmmmm, ain’t nobody got time fo dat! Thanks for looking. Check out my new Bestie! Skyfall = perfect Fall color. It’s a a beautiful oxblood crème, it’s vampy but not like a vamp on steroids you can definitely tell it’s a red even in low lighting so I don’t even know if vampy is the right description for it lol. It does lean slightly brown. This is 2 coats. The first coat was a little streaky but the 2nd coat made it perfect. 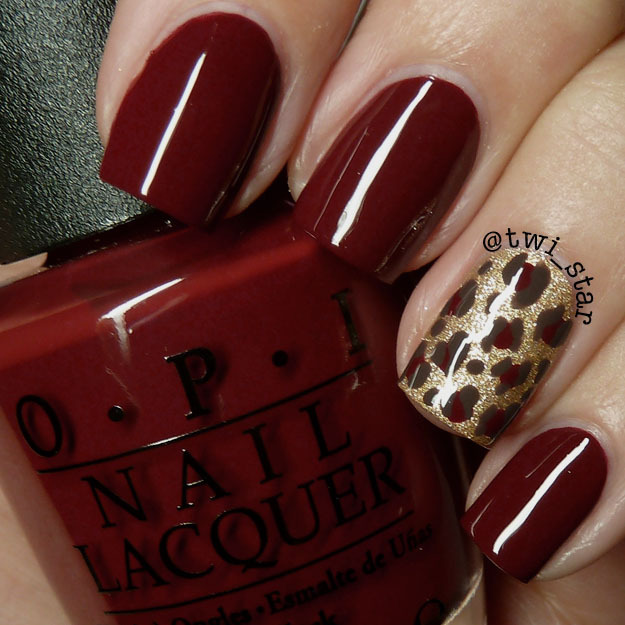 For the base of my accent nail I used OPI Love. Angel. Music. Baby. (aka LAMB) from the Gwen Stefani collection. I adore this gold, it’s a satin finish and has such delicate but rich shimmer. 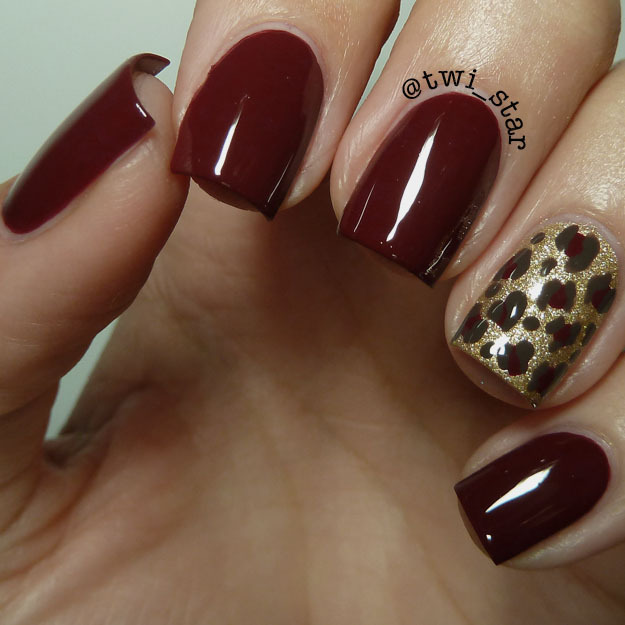 I can never decide if I like it better with or without topcoat……… This is 2 coats, wonderful formula. 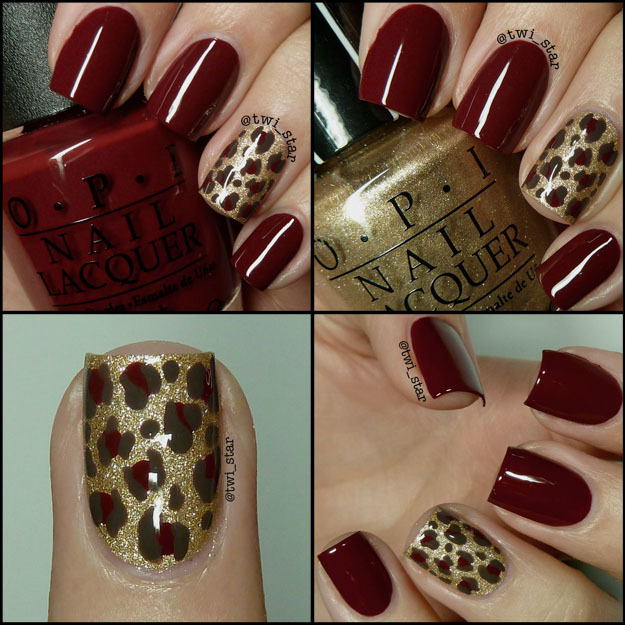 I used Skyfall as the center dot of my leopard spots and OPI How Great is Your Dane from the Nordic collection. It’s a very neutral brown, I can’t really comment on the formula since this is the first time I have used it but it seems ok maybe a bit thin? I really liked this color combo! My leopard spots weren’t the best, I’ve done better lol Normally I make them a little bigger, but whatever they were still cute hehe Thanks for stopping by. Check out what I paired it with. I mean really. Just look at Big Bang. It’s like a glitter lovers dream, and she makes me swoon. This is 2 coats, not thick coats either just normal. 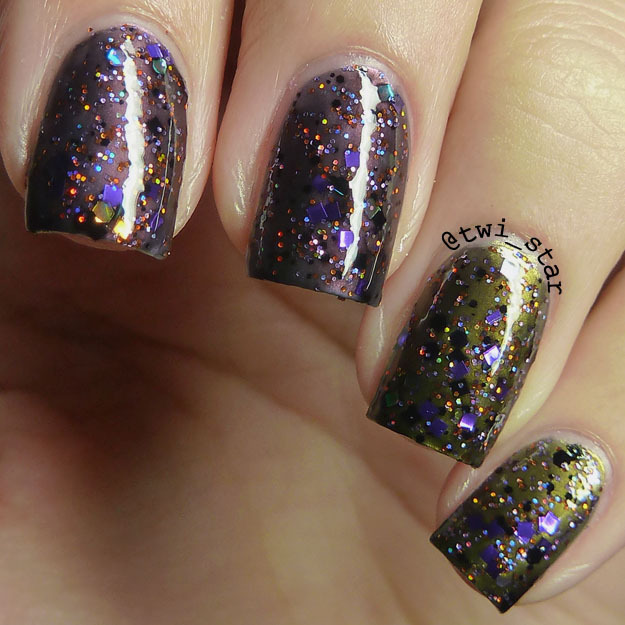 It applies so perfectly for a glitter and dries nice and fast. For my neutral I chose Julep Ginger, a very subtle beige holo. 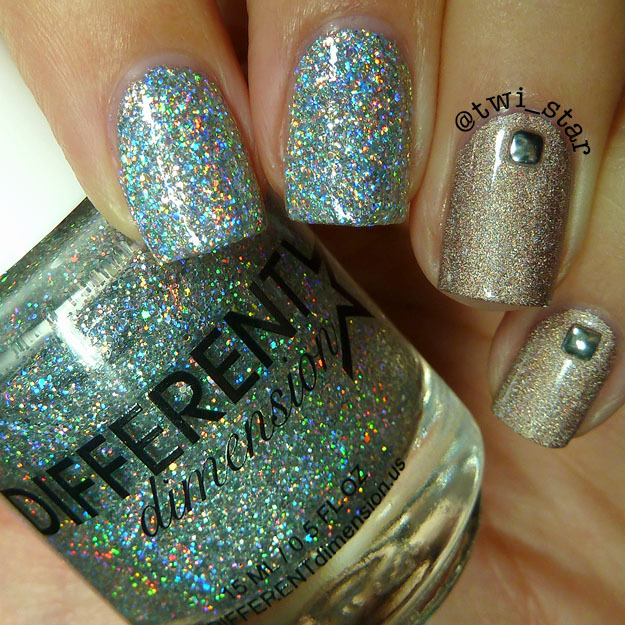 I like subtle holo’s but I could see crazy holo lovers not liking this one. It does throw a little rainbow action just enough to add some drama but no spectraflair action here. This is 2 coats, the formula was really great and smooth. I used 2mm silver square studs that I got from ebay. This combo was exactly what I was in the mood for! And I just want to wear Big Bang every day of my life for forever. Ok, maybe an exaggeration but I think it would take me a long time to get sick of haha Thanks for visiting! I was in the mood for something dark and subtly Halloween-ish. Black and green right? Haha! I’ve had poor Julep Etta waiting in the wings to try for a couple months already, poor thing. Etta is a shimmery peridot and just kinda glows in the bottle, in other words she’s perfect. I used Julep Jet at my base. 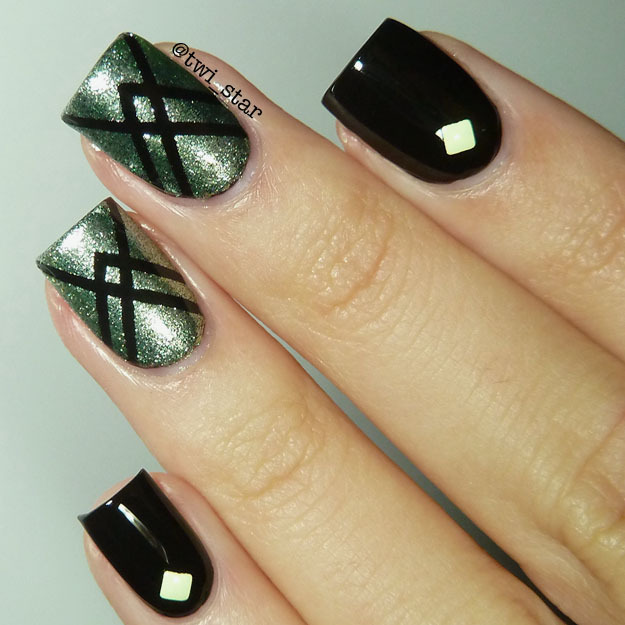 A great basic black crème, shown here is 2 coats. And then there was Etta. Le sigh. I was hoping it would layer well over Jet, doing that bright glowy thing sheer colors do when worn over black, and it did! This is one coat of Etta, even though it is sheer here I think it would be pretty opaque at 2 coats. For the stripes I used striping tape over Jet in an “X” and “V” pattern followed by one coat of Etta and quickly removed the striping tape. Somehow this reminds me of spiders, eeeekkkk! The studs are 2mm neon light green from ebay. 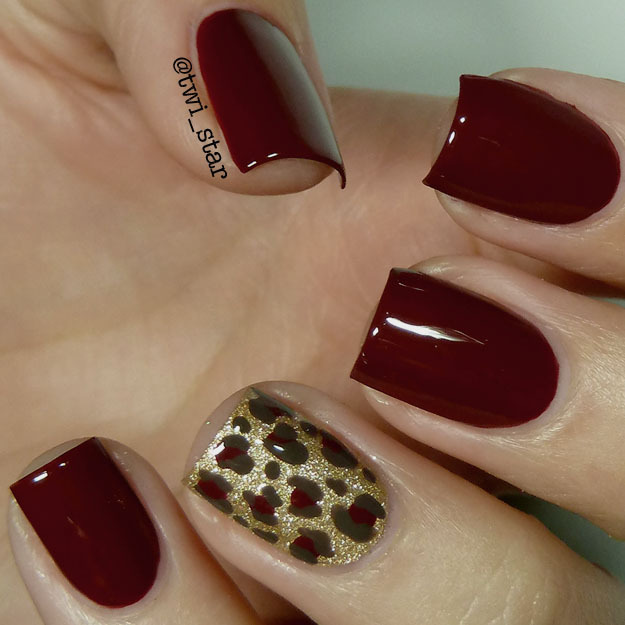 I loved the way this mani came out! 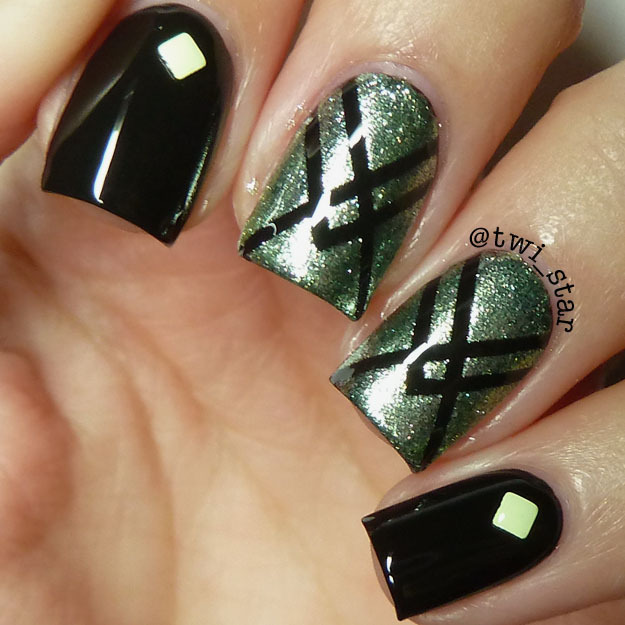 I think this would be a really cool pattern to try with a glow in the dark polish. Thanks for reading! 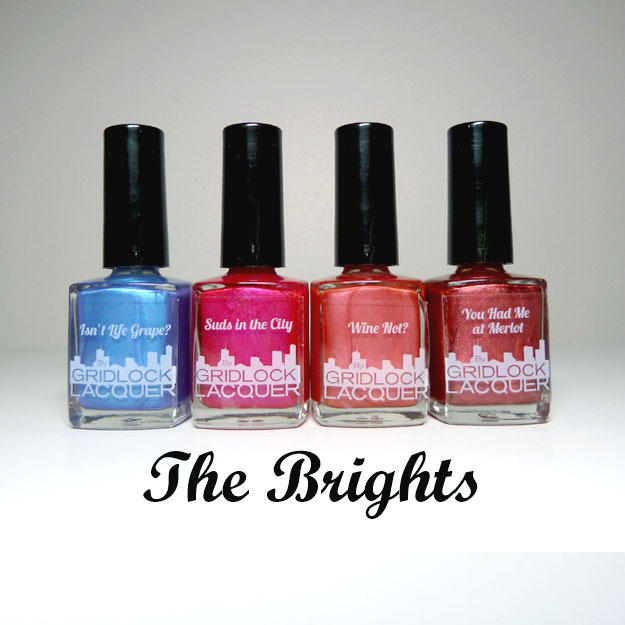 I used Nails Inc Great Marlborough Street on the ring and pinky. It’s a gorgeous vampy plum crème, it looks almost black but I love those type of colors. This is 2 coats, the first coat had me worrying it wouldn’t be opaque in 2 coats but that 2nd coat was like magic and went fully opaque. A great color. 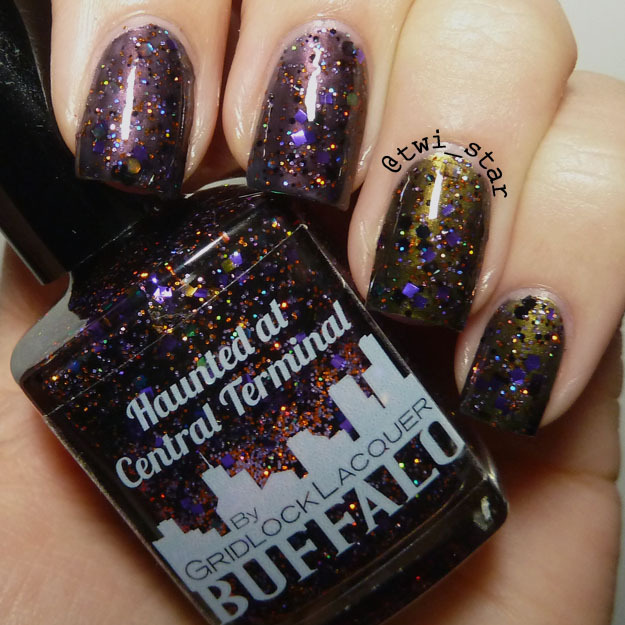 Gridlock Lacquer Haunted at Central Terminal Halloween mani! 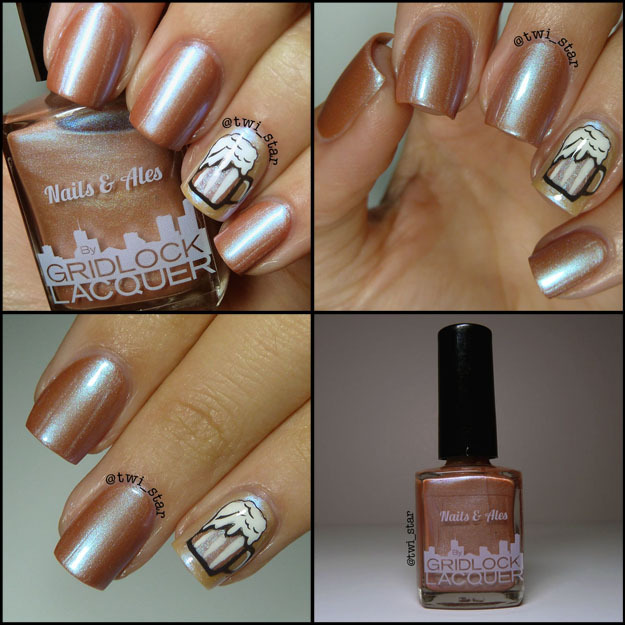 Last week I posted a mani using Gridlock Lacquer's new Halloween polish Haunted at Central Terminal. I used it by itself but since it’s a jelly like texture I thought it would be fun to try layering it. I think I like it better layered! 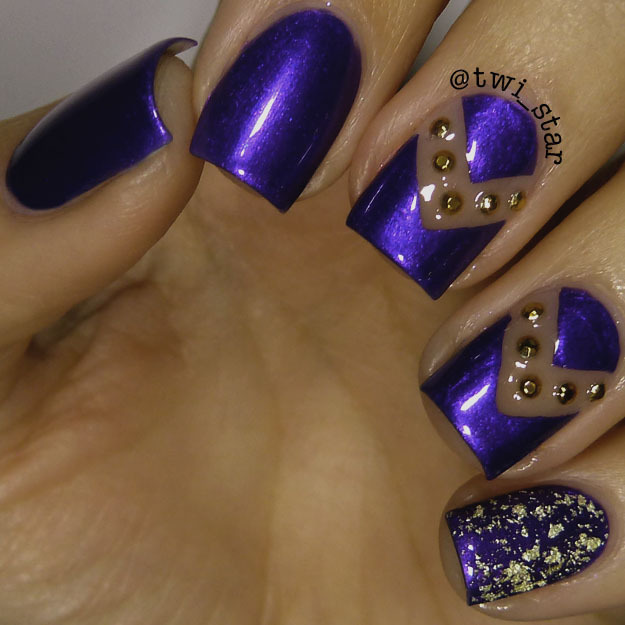 It helped to bring out all of the different colors and shapes of glitter a little better. Isn’t it cool?! 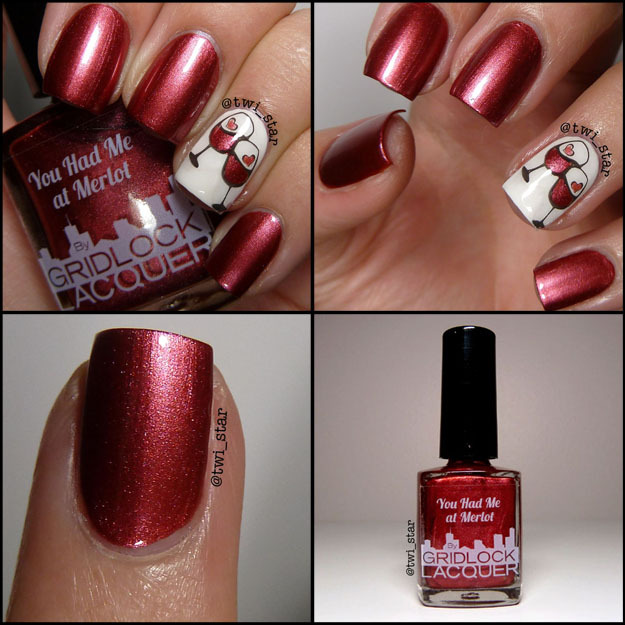 As my base I used Gridlock Lacquer’s Garden Walk on the pointer and middle and Delaware Park on the ring and pinky. Garden Walk is a lovely pearly purple and Delaware Park is a peridot. 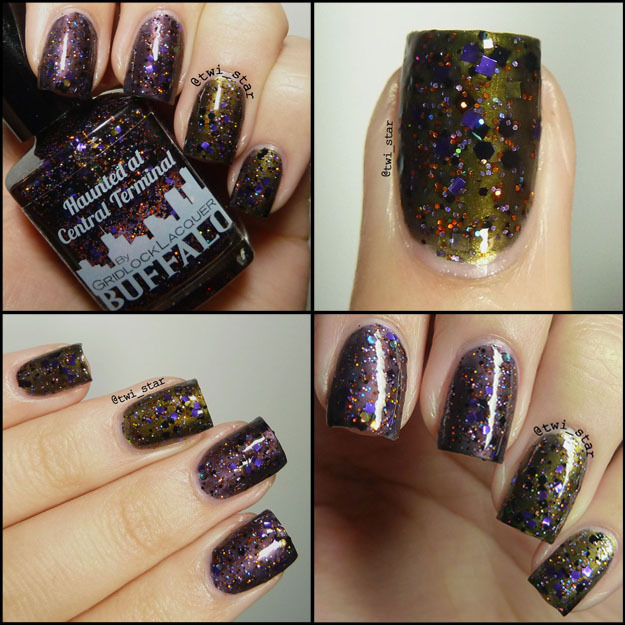 I then layered 1 thin coat of Haunted at Central Terminal over. I love all of the glitter in this polish, so much Halloween going on here. I think I like it best over Delaware Park, the black jelly base of Haunted at Central Terminal turned the peridot base into a murky chrome green, so cool! 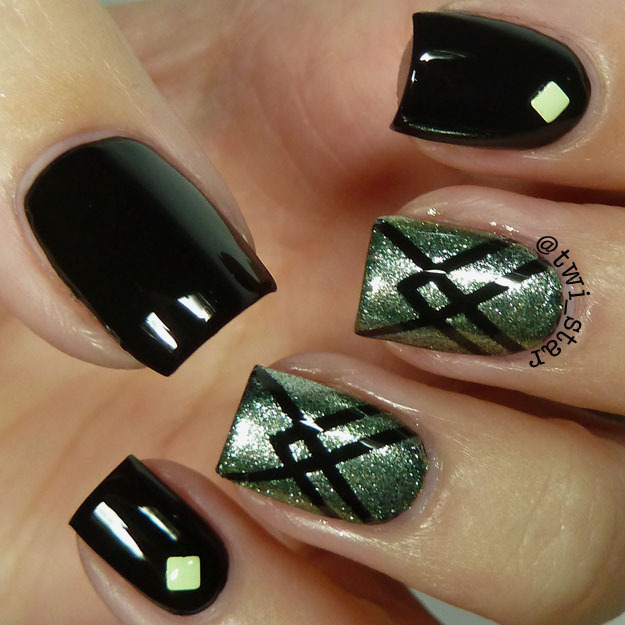 I think this mani is pretty spot on for a moody Halloween look, would be great for a witch costume. Thanks for looking!